i've had the exact same issue, however, i've had to use the version of NativeUI that came with the mod, which fixed the issue, seems like a large majority of the mods aren't being updated, such as the map editor. unfortunately there doesn't seem to be a fix for this at the moment. Damn. If I use the one that comes with MapEditor, I can't use other mods which require 1.8 NativeUI. Welp, anyways. Thanks for letting me know ! Also, notice that the link to Native UI available in the Map Editor download redirects to version 1.8! Despite me, having Map Editor with Native UI 1.7 (sic!) I can still operate Map Editor successfully... Having said that, I believe it is unlikely that this resource alone is a culprit. I really believe that the cause of your problems lies elsewhere or that there is something peculiar going on in your folders. 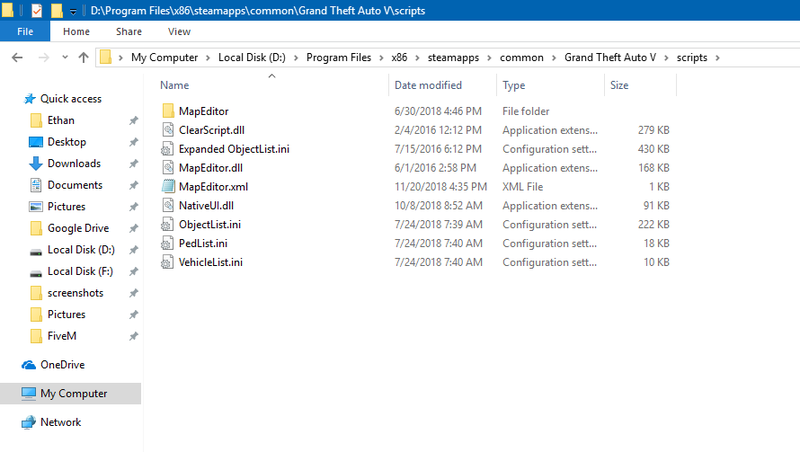 Though it sounds like a no-brainer, I suggest you take some time and carefully clean up your GTA5 directory and scripts folder. Delete any leftovers and unused files because they often cause conflicts between various resources. I did a whole clean-out with literally just MapEditor and NativeUI installed for mod wise. Nothing else. I didn't run RPH so it didn't put the plugins in. Yet it still gave the issue. It's an issue with MapEditor, not NativeUI. It hasn't been updated in forever and now it's finally paying the debt because R* must have done something in the UI or whatever to make an address or something different. As I have said, the NativeUI.dll that comes with the MapEditor works fine. The 1.8 does not. 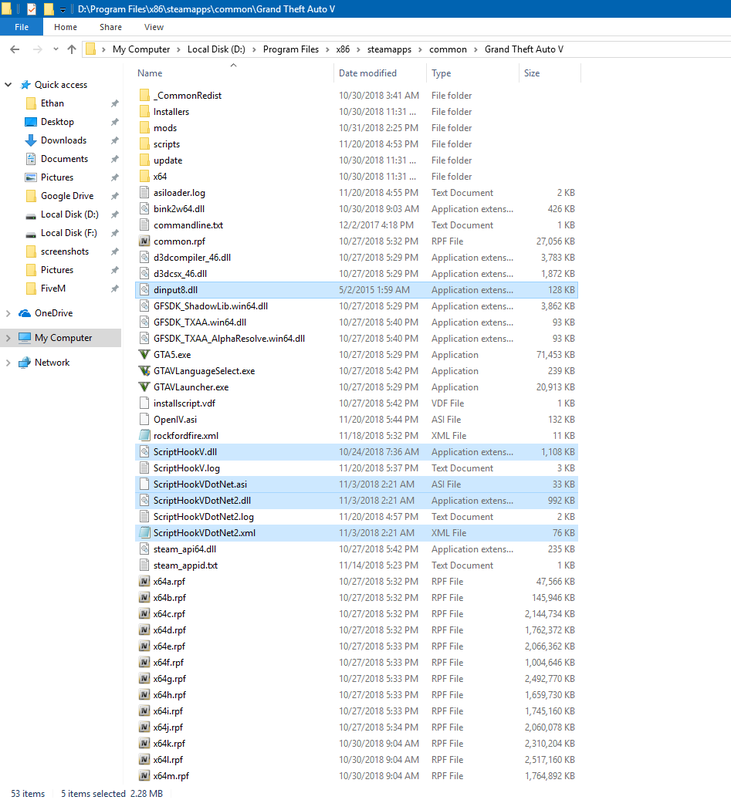 Show me a screenshot of your scripts folder with the NativeUI and its size showing. Hey there @homework. I think I owe you an apology... I managed to reproduce your problem and you are right indeed - Native UI 1.8 does not work with the latest Map Editor release. Map Editor won't run with the Native UI version that is supposedly "recommended" by the Editor's author. Given that, I believe this is either Native UI or Map Editor that is at the root of the problem. As such, it is either of the two authors of these resources that should take steps to make it right. I know the Map Editor is made by @Guadmaz. I'm not sure who is in charge of Native UI though. Since I have a number of successful and well-working mods by Guadmaz, I think it is safe to say that the problem lies within Native UI 1.8 exclusively. I have no idea though, why all your other mods stop working when you don't use 1.8 version. All my mods and scripts work on both versions of Native UI and the Map Editor is the sole exception where it does not. Turns out I have used version 1.7 for ages but ran into no problems whatsoever. Hey man no need to apologize, we all make mistakes and errors! It's natural . The problem is I would use 1.7 NativeUI but one of my mods 'Pull me over' I think requires 1.8 or it doesn't work fully. I want MapEditor to work alongside of Pull me over, but it's not possible unless I use 1.8 so yeah. I do hope NativeUI or MapEditor will receive a fix soon maybe if the developers see it. And how attached are you to the Map Editor itself? If you need a content creator tool you could just temporarily switch to Menyoo and build stuff there. Seems like a good workaround to me. Note that it is not Native UI dependent, so you can stick to using version 1.8 for the "Pull me over" and just having script hook to operate Menyoo. You could even use the Rockstar Director Mode instead of Map Editor. But I think you can only have 3 scenes prepared at a time and control 10 or so actors with the in-built tool. I would usually advise using Menyoo instead of Map Editor, because it has less requirements and, at the same time, some serious advantages over the latter. The thing is I need MapEditor for MapBuilder Pro. It's a Patreon mod which adds like 10000+ or whatever props/objects for maps found on here. I also need it for autoloading an .xml unless there's somehow I can use Menyoo for that? Ok, I see now. Well, I'm not an expert as far as this tool is concerned. Sounds like fun though. I don't know about an autoloading option, but I have a vague feeling it should have one! After all Menyoo uses nothing else but .xml files, so perhaps there is a way to do it. Maybe I'll check it the next game session. Just let me know if you have a solution!